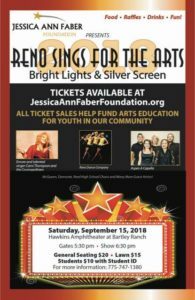 Jessica Ann Faber Foundation presents “Reno Sings for the Arts 2018: Bright Lights and Silver Screens” – a variety concert featuring music from movies and musicals performed by a cast of about 130 performers. 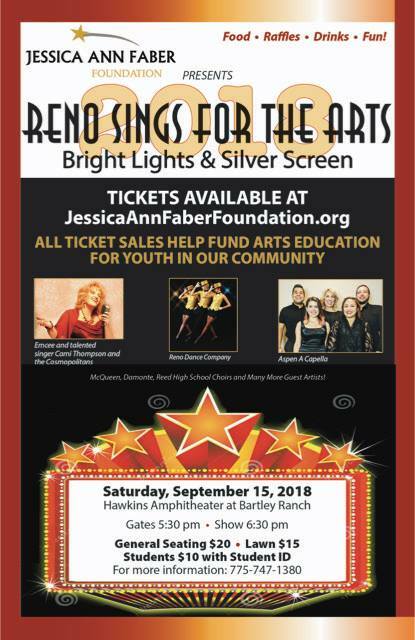 You’ll enjoy performances by professional guest artists Cami Thompson and The Cosmopolitans, Cindy Sabatini, Ian Sorenson, Brad Fitch, and Evan Gadda, the new 5-voice a cappella group Aspen, McQueen, Reed, and Damonte Ranch High School Choirs, plus choir directors Maribeth Burt and Malary Engstrom, the Reno Dance Company, and our current talented JAFF scholarship students Dani Jasper, Tyler Gordon and Aurora Peterson. The Cosmopolitans band backing up Cami and many of the performers is filled with a Who’s Who of great musicians: drummer Tony Savage, pianist Ron Savage, bassist Mac Esposito, guitarist Joey Berger, trumpeter Tony Cataldo, trombonist Phil Jerome, and saxman Doug Coomler.